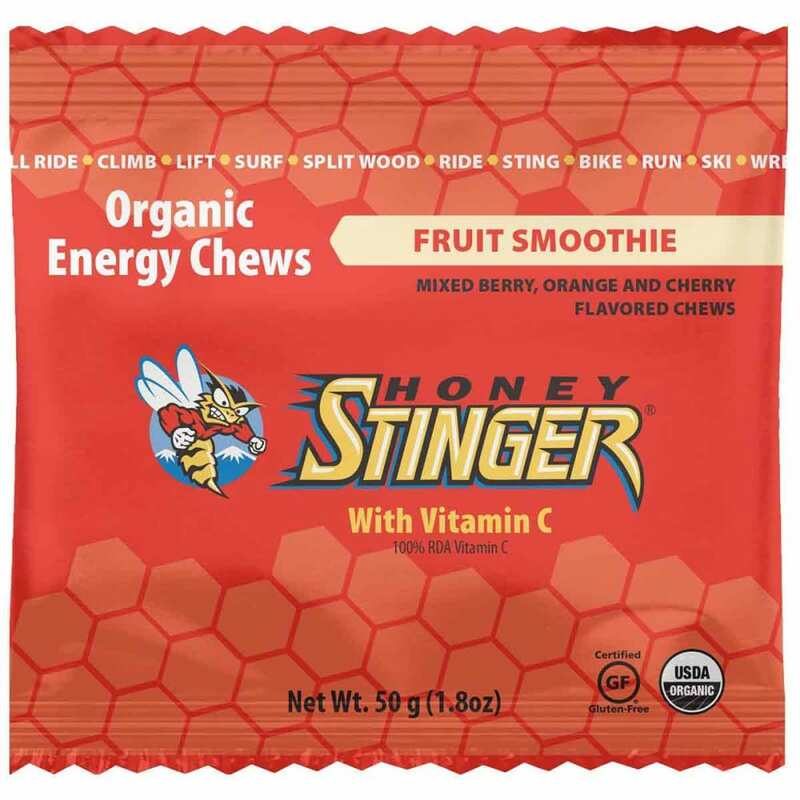 Honey Stinger Organic Energy Chews are formulated specifically for health-conscious individuals and athletes seeking a great-tasting energy snack. 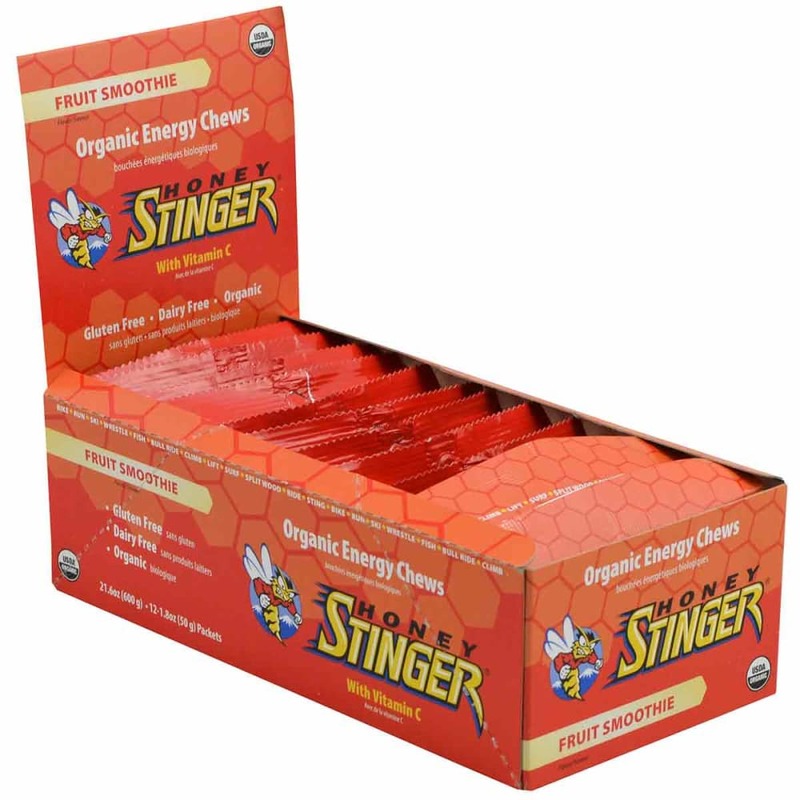 These bite-sized chews include 100% RDA of Vitamin C and natural energy from honey. Cherry Blossom: Organic Tapioca Syrup, Organic Sugar, Organic Honey, Organic Grape Juice Concentrate, Pectin, Citric Acid, Organic Black Carrot Juice Concentrate Color, Natural Flavor, Ascorbic Acid, Potassium Citrate, Organic Sunflower Oil, Carnauba Wax. Fruit Smoothie: Organic Tapioca Syrup, Organic Evaporated Cane Juice, Organic Honey, Organic Grape Juice Concentrate, Pectin, Citric Acid, Color (Black Carrot Juice Concentrate (Red), Annatto (Orange)), Ascorbic Acid, Natural Flavors, Potassium Citrate, Organic Sunflower Oil, Carnauba Wax. Orange Blossom: Organic Tapioca Syrup, Organic Evaporated Cane Juice, Organic Grape Juice Concentrate, Organic Honey, Pectin, Citric Acid, Ascorbic Acid, Color (Black Carrot Juice Concentrate (Red)), Natural Flavors, Potassium Citrate, Organic Sunflower Oil, Carnauba Wax. Pomegranate Passion: Organic Tapioca Syrup, Organic Evaporated Cane Juice, Organic Honey, (Organic Grape Juice Concentrate, Ascorbic Acid), Pectin, Citric Acid, Organic Color [Black Carrot Juice Concentrate (Red)], Natural Flavor, Potassium Citrate, Organic Sunflower Oil, Carnauba Wax.